McAllen Rowe quarterback Jonas Ortiz (8) looks to pass during a game against Laredo Alexander in a Bi-district game at McAllen Veterans Memorial Stadium on Thursday, Nov. 16, 2017, in McAllen. 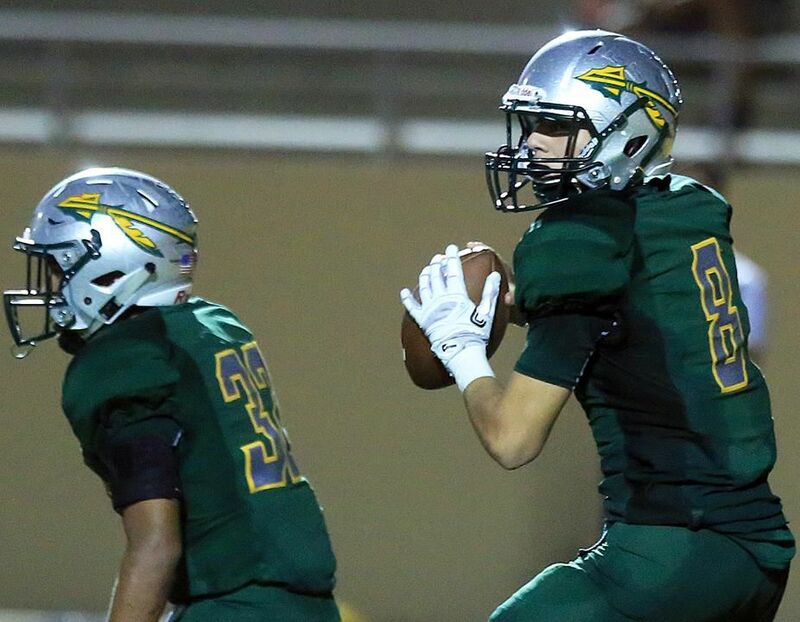 McALLEN — Many of McAllen Rowe’s leaders sweating it out under the sun at preseason practice are a year away from their senior season. The Warriors are leaning on youth, primarily the 2020 class, to guide the Warriors back to the playoffs. Though it may sound like a tall order, the players at two of the most crucial positions in 2017 were sophomores as Rowe went 7-4 and 4-2 in district. Jonas Ortiz, who stands 6 feet, 3 inches, moved from tight end to quarterback when Rowe senior QB Jesus Sanchez went down to injury, and Ortiz proceeded to guide Rowe to six straight wins. On defense, linebacker Josiah Alonzo was in a similar situation, moving up from the junior varsity and eventually starting at middle linebacker. Click for the full story and find more high school sports coverage on RGVSports.com.